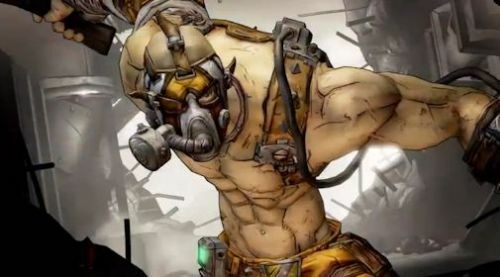 Today Gearbox took the wraps off the previously hinted at piece of content for Borderlands 2. The DLC is called The Psycho Pack and will costs $9.99. It features a brand new vault hunter named Krieg for players to take control of. In addition to the new character Gearbox announced the level cap would be increased to 61 in early April as part of the Ultimate Vault Hunter Upgrade Pack. So who is Krieg - a character that looks quite a bit like the bandits in the game already. The official class name is "Psycho Bandit" and he's a melee focused character with special ranged abilities. Wielding a buzz axe and harnessing his psychotic multiple personalities, Krieg is a badass melee mauler with ranged attack capabilities that can rip foes to shreds with his deadly Buzz Axe Rampage action skill. Players can stack combat bonuses with Krieg’s Bloodlust skill tree, live on the edge of insanity with the Mania tree, or engulf both enemies and yourself in flames with the Hellborn tree. The Psycho Pack is slated to be released in May. The Ultimate Vault Hunter Upgrade pack will unlock a third playthrough of the game while also increasing the level cap from 50 to 61. The DLC is included as part of the season pass or will be available separately on April 2nd.